Your Earth resistance decreases by round(1.7*ClassLevel)%. Your Fire and Darkness resistances decrease by round(1.2*ClassLevel)%. Your Water and Energy resistances decrease by round(0.7*ClassLevel)%. Your Ice and Light resistances decrease by round(0.5*ClassLevel)%. Your Wind resistance decreases by round(0.5*ClassLevel)%. The robes of a Wizard who specializes in Earth magic. Get this if you want to learn mighty magical abilities like Sinkhole and Earthquake as well as many more. Your Magic Earth spells costs ClassLevel% less MP, SP, and HP. SP and HP aren't working right now. Melee and Ranged spells are unaffected, regardless of their element. This only applies to spells whose database element is Earth. For example, Spellcraft will NOT get the bonus, since it's Neutral. Your affinity with Earth allows you to greatly boost the power of your Earth spells! All your Magic Earth spells deal (124.53 + 3.25*ClassLevel + 0.15*ClassLevel^2)% damage. Melee and Ranged spells are unaffected, regardless of their element. This applies based on the individual hit of the spell. For example, Elemental Doom WILL get the bonus for the Earth hit, and only for that. 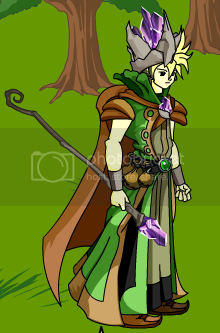 Infuse yourself with the raw power of Earth and use yourself as the weapon! 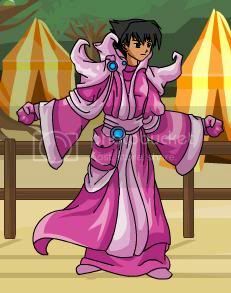 Your experience with manipulating Earth has imbued your robes with some of its power! You get -6% to your Earth resistance. If Tectonic Lore isn't on OR if you don't have enough to pay for the full Tectonic Lore version (including the *1.75), then it costs 0.76*round(38.1 + 2.3375*ScaledPowerLevel + 0.01125*ScaledPowerLevel^2) MP, rounded normally. You can efficiently imbue your Earth spells with power directly from the Elemental Plane of Earth! This affects Rocky Potency. Instead of the usual boost, Rocky Potency boosts your spells by ([Normal RockPot Boost] +50)%. Note that you ALWAYS pay for the increase; so, don't cast non-Earth spells while this is in effect. Also, this applies based on the individual hit of the spell. For example, Elemental Doom WILL get the bonus for the Earth hit, and only for that. Conjure a spectral fist of pure Earth energy to crush your opponents! You can toggle between these two options. They control how Earth Sage works. Your continued experience wielding raw Earth has taught you how to reduce your vulnerability to its polar opposite: Wind! If Sage Defense is active, then you gain -7% to your Wind resistance. If Greater Sage Defense is active, then you gain -14% to your Wind resistance. You gain round(38.1 + 2.3375*ScaledPowerLevel + 0.01125*ScaledPowerLevel^2) MP. This is directly added to your MP; it isn't affected by Rocky Potence nor Ironthorn nor anything that usually modifies healing. Make the ground under your foe disappear by creating a small, hungry gate to the Elemental Plane of Earth underneath them! Invoke the purest essence of Earth to give your enemy an Aftershock - and try to Petrify them as well! If either of the first two hits connected and did >0 damage, then it attempts to inflict Aftershock on the monster. The monster gets a -10 penalty if both hits connected and did >0 damage, or a +20 bonus to its save if only one did. The Aftershock deals Earth damage, lasts 1d4+1 rounds (which means either 2, 3, 4, or 5 rounds). The "modifier" is *15/51 damage. Earth-element monsters are immune to this. If the third hit connects and deals >0 damage, there is a 77% chance of attempting to Petrify the monster for one round. Earth-element monsters are immune to this. Armor image thanks to Mystical Warrior. 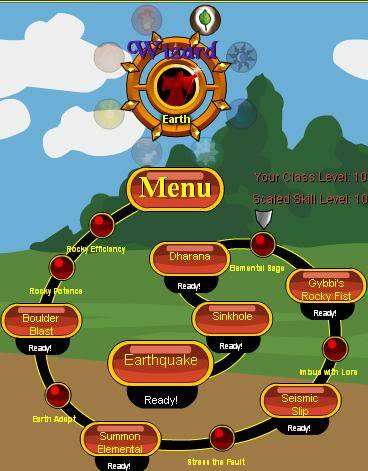 Skill menu image thanks to Scakk. Information from many people, including algimantas2, Thylek Shran, Chii (via Skytalker), Khimera, fenmeisterkronos and Ward_Point. Numbers and the majority of the write-up and appendices thanks to In Media Res. Update thanks to Kalanyr (via Scakk). Correction thanks to Kamui. DO NOT apply Rocky Potence nor Tectonic Lore to the damage. DO apply the MP cost increase for Tectonic Lore.